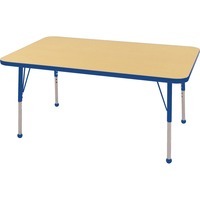 ECR4KIDS Toddler Table ECR14810MBLTB $239.60 Rectangular Adjustable Activity Table is perfect for the classroom, playroom, home or office to create extra play or work space. Tabletop features a double sided, easy to clean maple laminate with rounded edges for safety. Toddler size legs with ball glides raise the table height from 15 to 23. Upper table legs are made of powder coated tubular steel while the lower legs are chrome plated and adjust in 1 increments. Color of edging matches the color of the upper legs and ball glides. Table is Greenguard Gold Certification and is CPSIA compliant for safety.